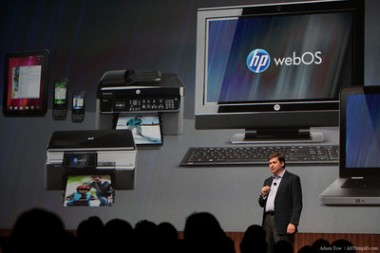 Hewlett-Packard has said it is open to all options for webOS, including licensing the operating system. However, a closer look reveals that may not really be a viable option. HP certainly removed one obstacle to licensing its webOS — it is no longer in the phone and tablet hardware game. But there are more reasons why the door that opened with Google’s planned purchase of Motorola has now been slammed shut. First of all, licensing webOS means continuing to develop the operating system, and HP gave no indication on Thursday it is really committed to doing so. It’s not a case of just taking webOS and offering it up and letting the checks come in. For all its niceties — and webOS has been praised for its overall approach and design — it’s not as if the software is on par with its rivals. While HP was quick to blame its hardware and deify the software, many of the flaws pointed out in critical TouchPad reviews had to do with software — both bugs and a lack of third-party app support. Plus, webOS competes in a fast-moving market filled with serious, motivated players willing to invest heavily in their products. Already ahead of the pack, Apple and Google are spending a pretty penny on their ecosystems. Microsoft and Research In Motion, like webOS, have work to do, but both are in can’t-afford-to-lose situations. Secondly, it’s not clear that there is much money to be made in licensing mobile operating systems. Google doesn’t directly charge for Android, and, while Microsoft does charge for Windows Phone, it is a whole lot less than the company gets for the PC version of Windows. NPD analyst Ross Rubin notes that licensing mobile operating systems is something of a catch-22. It’s also not a business that HP knows much about — the company has spent the bulk of its existence as a licensee of operating systems from Microsoft. But more than anything else, HP just doesn’t seem to have the stomach to be in the mobile game. The company was finding it hard enough to get developers and partners even when it was talking up webOS as the greatest thing since sliced bread — and the future of its PCs, printers and mobile devices. How would HP ever convince those same partners and developers, now that it has revealed it is no longer really interested in webOS? That leaves HP with the option to sell the operating system, sell Palm’s patents, or both. HP And webOS: But They Seemed So Happy Together! HP’s Apotheker: We Struck Out with WebOS, but Maybe Someone Else Wants a Swing? Hewlett-Packard’s PC Business: What Happens Next? Worth More Dead Than Alive: Could HP Turn a Profit on Palm’s Patents? With HP’s Raising of the World’s Biggest White Flag, Will Jon Rubinstein and Todd Bradley Surrender Too?